With the current studio stand, Samsung’s QLED TV is designed so it can take a center stage in a room, unlike most TVs in the current market today. Taking this as the main advantage feature, we set out to create a stand that is designed with the viewing environment and the experience in mind. How do we further enhance the QLED TV experience through a new stand design? The Tail on the Peacock Stand expands and functions as a divider that visually frames the TV and separate the viewing area and the rest of the environment. The engineered fabric can enhance or dampen the TV sound, depending on which side a user is at. 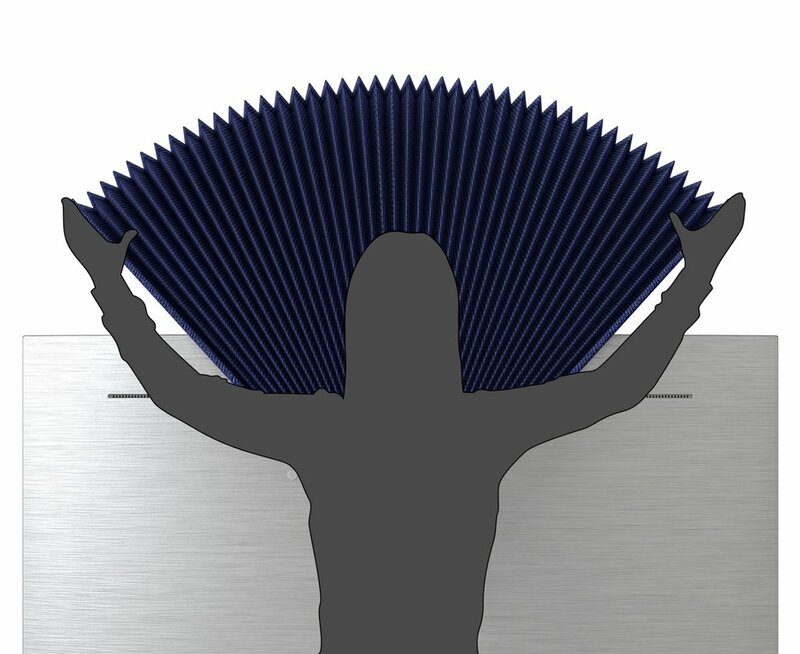 The material on the front side of the tail is constructed with audio-reflective fabric to direct and amplify the sound towards the viewing area. The Peacock Stand's mounting mechanism is designed to hold the TV using the design on Samsung QLED TV without any additional parts. The divider on the stand is easy to open and close depending on a user's needs.